Salón de Vinos Naturales (3 Edición): What Classifies as “Natural Wine”? A few Sundays ago, I attended the 3rd edition of the Salón de Vinos Naturalesa, an annual event held in Barcelona and hosted by l’Ánima de Vi. We stumbled across L’Ánima de Vi several years ago while wandering the backstreets of Gracia, which features natural wines from Spain, France, and occasionally, various other parts of the world. Though elated that I was able to attend, admittedly, I’m a very skeptical “natural wine” advocate. When you talk about wine, you are talking about one of the most unnatural processes used to create a consumable. Allow me to clarify. Plant the carrot from a seed/sprout. Water it, weed it, or in some cases, just wait. Pull carrot from earth, dust off dirt (optional), consume. Now, of course we’ve created an entire commercial process around this product, but on a very basic level, if I grow one, the steps are very similar to what our ancestors undertook so many centuries ago. That said, let’s take the wine we drink. Find a grape vine whose characteristics you like. Then take cuttings from it. Plant those cuttings into a hillside, or any other location that a reasonable farmer would never look at, usually characterized by hills, rocks, and stunning beauty. 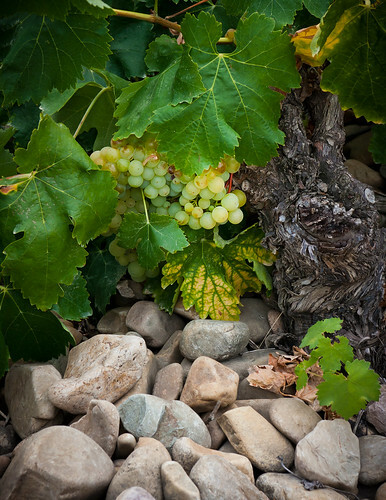 Fight to keep the vines alive for up to 7 years before the first harvest of quality wine producint grapes appear. This battle to keep the vine alive will include: fertilizing, either naturally or chemically; pest/mold control through either the application of chemicals or “naturally” with sulphur or copper; aeration; and pruning by hand or machine, in order for the vines to grow into the desired shape. Around the 7 year mark, harvest the fruit either by hand, which takes both time and manpower, or machine. Put the fruit into a container for it to ferment. Can’t just have it lie on the ground, now can we? That container is a large man-made tank, barrel or bucket – your choice – but it’s not very often a natural vessel (if ever). Decide, do you add yeast, or let the natural yeasts stick to each grape berry to ferment on their own. Next when the fermentation is done, do you: age it in barrel? stabilize it? let it go through malolactic fermentation? At some point, you’ll need to sell it. So the most ‘natural’ way would be for people to swing by with straws and take a draw off the barrel, but I assume you would probably opt for the more conventional technique of bottling it. If it goes into bottle, do you cork it? screw it? 🙂 or bag it? Last I checked, the ‘natural’ animal skin wasn’t a market favorite. Then to ship it/truck it/ fly it/ or carry it to its interim destination; after which, someone will hopefully buy it and enjoy it. Use of natural yeasts – spontaneous fermentation and non-inoculated wines. Use of ground cover to keep soil healthy and prevent evaporation. Maybe you go down the farmers almanac route or Biodynamic route and attempt to follow the moon or stars. I’m sure this post will bring out a few people who want to contribute additional points in the comments below, so I won’t go on. This is a VERY short list of what would be considered “natural wine practices” even by the most conservative of advocates. That said, for the most part, I like the idea of natural wine. I love the notion of a chemical free romance with the liquids I consume. I love the passion that this movement foments in the practitioner’s hearts. This is why I love wine. What I don’t like is when someone says, “Natural wine is the only way” and that, “We need to stop the big wine industry from producing boring wines”. Well I for one believe that Yellow Tail has done a lot to get more wine drinkers to discover wine. I also believe that the “big wine” lobby, as it were, has helped to increase the consumption of wine in the USA to record levels. Likewise, I do think that kraft macaroni has led to the birth of more than a few food snobs – albeit via a very circular route. I asked my friend Fabio Bartolomei of Vinos Ambiz his thoughts on what Natural wine is, and his response was reassuring, if it actually reflects the larger community. Read his viewpoint here! Regarding the style of natural whens, when I inquired what people thought of the wines they tasted at the fair, they typically replied with “interesting”, rather than “good”. In fairness, many stated that there were many good wines, but that equally, there were many “odd” or “peculiar” wines. Fabio’s response to this was simple, “Many of the wines have what ‘experts’ might call flaws, but that we enjoy or appreciate”. I found this odd and refreshing. Having tasted about half the wines on display, and finding an “off” characteristic in many, I wondered what was “good” and what was “bad”. Taste is subjective, though I would assume at some point we all need to agree on some idea of what is good and bad. That said could some people build up a personal liking for Trichloroanisole? The chemical responsible for “cork taint” or as our friend Ken puts it: a hacked wine. This is a flaw agree upon by many, if not all, wine “experts”, but could it be a flaw that some might learn to love? I guess other flaws are easier to rationalize, such as oxidized wines, which may be called flawed. On the other hand, oxidation is an attribute of Sherry, and when done slowly, is desired in old Bordeaux’s, Ports and other wines. Regardless, the fact is that natural wines are here to stay, and much like our recent trip to Croatia, the wines are often very surprising in what flavors you may discover. From the freshly fermented white wines of our friend Fabio to the overly oxidized and heavily wooded Miquelius, whose 2005 Bobal read more like an Amontialldo sherry without the alcohol or percieved sweetness. Odd, oxidized, “flawed” by any competitions standards, but in the end, not something I would necessarily toss. That said, not all the wines at the tasting exhibited strange or unusual flavors. A few were down right incredible. Els Bassots (100% Chenin Blanc) from Conca de Barbera is a white wine from Cellar Escoda-Sanahuja – who also makes a mean Pinot Noir – was by far one of the most exciting white wines I’ve had in awhile. Follow that up with the producer Clos Vignes du Maynes whose Gamay/Chardonnay sparkler was a delightful discourse on bubbling minerals. There was also a wine made from Gamay, which according to the wine maker, sat on a pile of loose stones, which apparently are being accused of embuing his Gamay with more minerality than you find at new age crystal convention. Mind-blowingly delicious, it’s on my list to bring home during our next visit to l’Ámina du Vin. I did ask a few people what the natural wine scene looked like in Spain right now. If you are a natural wine advocate I will say that most were downbeat on the subject. 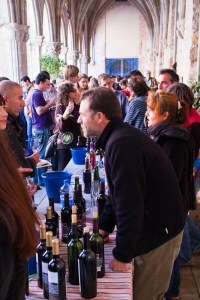 Around 15 wineries seemed the party line when asked “How many Spanish wineries are ‘natural’ today”. Out of 5,000 registered wineries, I guess we have a ways to go. Just to wrap up, I want to make clear that I am no expert in natural wine, nor do I hope to be. I love liquids, as you know, and I find these wines to be interesting and worth seeking out. This is merely a small introduction into the world of natural wines in Spain, but if you’re passionate about the subject as a whole, check out: Ken Payton for a more technical viewpoint; Isabelle Legeron, someone I enjoy debating with anytime we share a glass together; and Alice Feiring if not the most vocal is at least a contender for most passionate natural wine advocate.